In the heart of Norte, Portugal’s most northern region, is the Peneda-Geres National Park which is home to the spectacular wildlife that once roamed all of Europe including its last great predators. In the centre of this park is the original natural forest surrounded by the thousands of hectares of mountainous wilderness which Portugal has worked hard to restore and preserve. If you are an outdoor/nature enthusiast this is definitely one of Portugal’s highlights. There is even an outstanding hotel to act as a base while you explore this beautiful area. 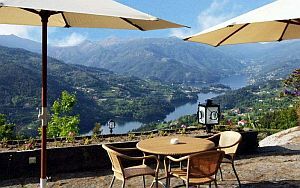 The Pousada Geres-Canicada was once a hunting lodge and has magnificent views of the Cavado River and the hills beyond. It has a very welcoming atmosphere, many of the rooms have their own balcony, and facilities include a swimming pool, tennis court, and restaurant specialising excellent local cuisine. As far as activities in this area there is everything from fishing and hunting to horseback riding and a number of water sports at the Canicada Dam. If you enjoy historical architecture the city of Braga is only 10 miles from the southern end of the park and has a very attractive old quarter. Dating back to the Romans, one of Braga's most famous tourist attractions is the Bom Jesus de Monte built in 1722 with an amazing staircase dedicated to the five senses that leads up to the church. If you carry on a little further south you can also visit the remains of Iron Age settlements on route to the World Heritage Site of Guimaraes. Without a doubt the park itself is the biggest attraction to this area with wildlife that includes wild boar, roe deer, eagles, and the last surviving wolves on this continent. There are pockets where modern living has not yet made its mark so it is not uncommon to see the local farmers still using oxen to plough the fields. There are Celtic ruins and medieval castles which tower above the hillside towns, and countless other ancient sites such as 3rd century Dolmen graves and a 1st century Roman road. You will even come across 18th century corn granaries, the most impressive found in the small town of Soajo and Lindoso. Much of the landscape dates back 300 million years with granite rock and u-shaped valleys carved by ancient glaciers. 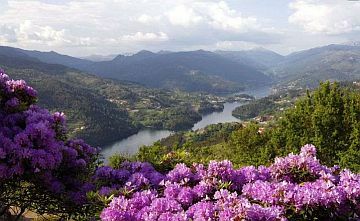 There are majestic oak forests and waterfalls cascading down almost every mountain side. Centuries ago wild herds of Guaranno ponies used to roam this area, however most have been domesticated since and nowadays you can hire one of these sure footed ponies to take you along the many trails that stretch across the reserve. At the end of each day you can even pamper yourself to the same thermal mineral springs which the Romans used centuries ago in the town of Calda de Geres. The best time of year to visit the park is in April and May when everything is in full bloom. For the more adventurous there are certainly plenty of exciting sports to take part in such as 'Canyoning which involves climbing rock faces. Or you can hire equipment and join one of the many climbing tours available. The old shepherd trails are perfect for walkers and there are maps available in the park itself to help you navigate your way around. Alternatively you can join a guided tour. If bird watching is something you enjoy the best place to go is the Mourela Plateau as there are over 137 different species in the park. But even if bird watching is not a particular passion you cannot help but be impressed as you watch Golden Eagles soar above you. Portugal can get very hot in the summer and thankfully the reservoirs, rivers and lakes offer many wonderful places to swim. But if you are looking for a rather unique experience there is a glorious spot to swim under the bridge of a flooded ghost town. The lakes also have facilities to go windsurfing, surfboarding, canoeing, and kayaking. So this is definitely a holiday destination with no end of possibilities when it comes to outdoor pursuits.